What Does a Runner-Up Crown Look Like? Kimberly-Clark (KMB) is a consumer-staples giant whose dirty diapers spread across 175 countries. Its brands are a who’s who of the personal-care and cleaning-products worlds, spanning Cottonelle toilet paper, Huggies diapers, Kleenex tissues, Kotex feminine products and Depend adult-care products. These forces have pulled on KMB shares, which have gained just about 11% over the past five years versus more than 50% for the S&P 500. And there’s little reason to believe things will get better soon. 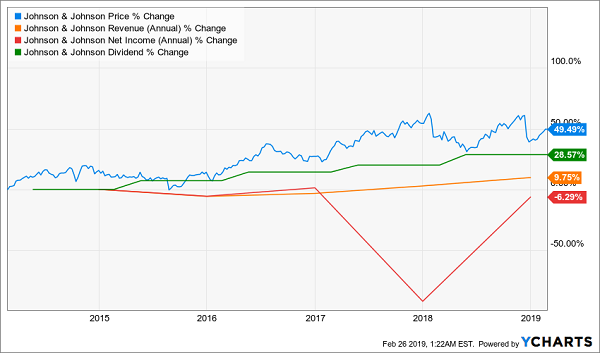 In January, Kimberly-Clark reported disappointing fourth-quarter profits (not good) and said that 2019 revenues would decline 1% to 2% (also not good), prompting earnings guidance with a midpoint ($6.60) that would fall a cent lower than 2018’s $6.61 in earnings (even worse). You can do better. General Dynamics (GD) is one of the big names in defense, boasting products such as the Abrams tank, Hydra-70 rockets and navy subs built by Electric Boat. But it also has other arms, such as Gulfstream business aircraft, communications systems and various information technology systems and services. It’s also the only Dividend Aristocrat to come from the defense industry. It’s a newbie to boot; GD joined the list of dividend-raisers in 2017, and it currently sports a streak of 26 consecutive annual payout hikes. 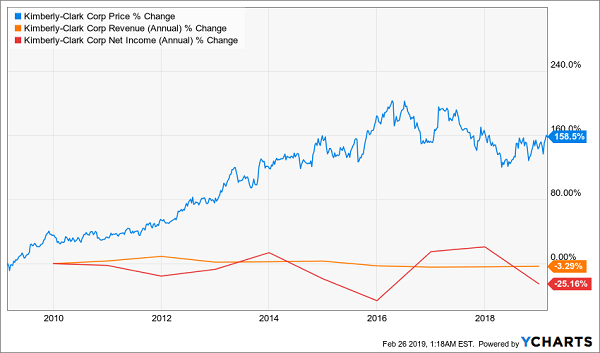 General Dynamics has lost quite a bit of altitude over the past year, shedding almost a quarter of its value. It’s not just a sentiment issue, though that certainly didn’t help – Democratic control of the house as well as the fourth quarter’s market-wide swoon weighed on GD. But so did margin troubles as the company started kicking a new submarine class into gear, as well as a pair of new business aircraft. Still, GD finished 2018 with full-year revenue growth in all five of its business segments, leading to a 16.9% ramp-up in both sales and net income. Better still, the company is looking at mid-single-digit revenue growth for the next two years, as well as profits that should improve by 16% by the end of 2020. That growth is coming at a decent price, with a forward P/E of 13 versus nearly 17 for the broader market. And dividend hikes are all but assured given GD’s lean payout ratio of about 33% of profits. I’ll say this for PepsiCo (PEP) – it’s a much more diverse play than its rival Coca-Cola (KO), boasting a snacks business (including Lay’s, Cheetos, Cap’n Crunch, Cracker Jack, Grandma’s cookies, Aunt Jemima) to go with its beverages division (Pepsi, Sierra Mist, Mountain Dew, Lifewater, AMP Energy). Last summer, I analyzed People’s United Financial (PBCT) and pointed out that it was on the verge of Dividend Aristocracy. 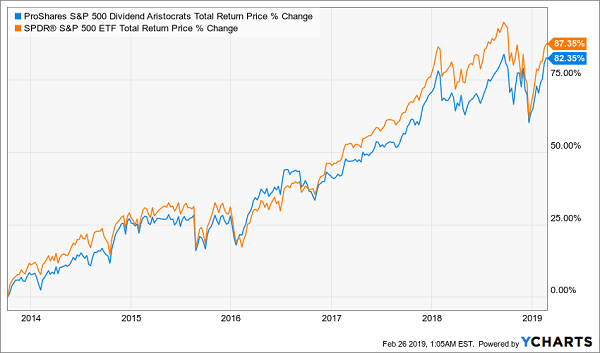 Well, it officially was invited into the ranks of the Aristocrats this year after notching its 25th year of dividend hikes in 2018. What does the future hold? More growth, says the analyst community. They’re banking on a 14% boost in the top line this year, filtering down to a 9% bump in profits. That should mean good things for PBCT’s payout, which is one of the most generous among the Aristocrats. 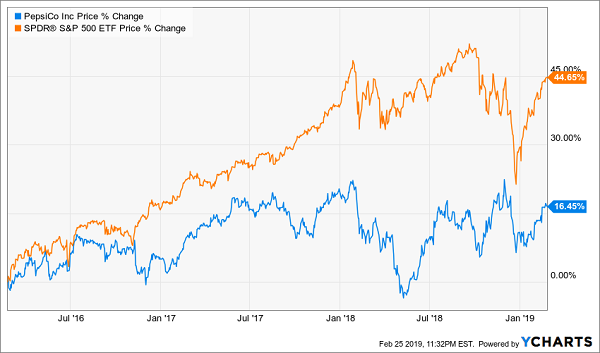 Johnson & Johnson (JNJ) is absolutely dividend royalty – a healthcare/consumer staples hybrid that has paid dividends since 1944 and increased them annually for the past 56 years. It has a laundry list of well-known brands, including Band-Aid bandages, Acuvue contact lenses, Neosporin ointments, Neutrogena skin care products, Nicorette nicotine-replacement products, Rembrant toothpaste, and I’m barely scraping the surface. But right now is not the time to get involved with JNJ. Johnson & Johnson has rebounded this year, sure, but so has the rest of the market – and JNJ is lagging it. Maybe that’s because Johnson & Johnson has a completely opaque legal environment on the horizon. Or maybe that’s because Wall Street is expecting the company’s sales to actually inch backward this year. Or maybe that’s because JNJ yields as much as the 10-year. Or maybe that’s because all of this can be yours for the price of the much growthier S&P 500. Becton Dickinson (BDX) is in the oft-overlooked medical-device industry. Pharmaceuticals are well-known for their fatter dividends, while biotechs get play for their uber-growth. But medical devices, while decidedly unsexy, are in a sweet spot where they still boast mature enough businesses to support steady and growing dividends, but enough growth potential to be true dual-threat plays. The dividend, meanwhile, has grown by more than 7% annually over the past five years. And considering BDX is only paying out a quarter of its profits to maintain the 77-cent dividend, there’s all sorts of room for that to expand along with stock prices going forward. Back to my earlier point. Dividend growth is one of the three core components to my “ultimate” retirement portfolio that will ensure you can tackle each and every one of your everyday needs with nothing but the dividends from your investments. The Dividend Aristocrats have that … but they often lack the other two legs that make this portfolio so potent. You see, to retire well, you need dividend growth … and substantial yields averaging 8% across the portfolio … and the ability to deliver capital gains to boot! These Dividend Aristocrats don’t have all three qualities. 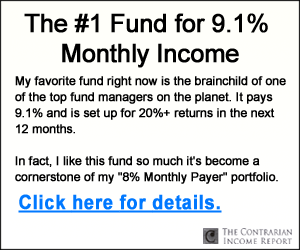 But the “triple play” stocks in my 8%-yielding “No Withdrawal” retirement portfolio sure do. 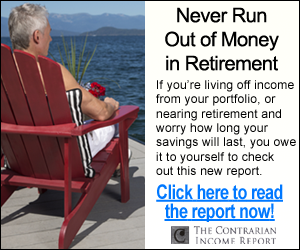 Your retirement income would be below the U.S. poverty line! Worse still, many of these companies are well into the later innings of their growth cycles … if they’re growing at all. So not only are you forfeiting any hope of significant stock-price appreciation going forward, but you’re doing it to earn minimal dividends on your hard-fought nest egg. You need more than three times that income, plus dividend growth to beat back inflation, not to mention capital appreciation to keep building your nest egg. That’s not easy to find, but a handful of winners in this market have what it takes.